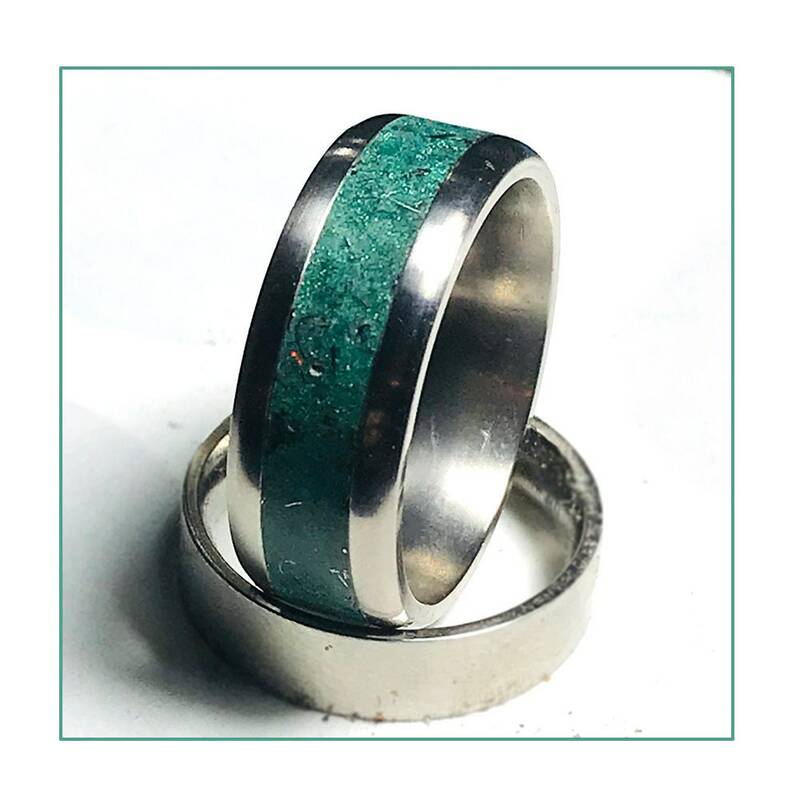 This gorgeous Titanium ring is a strong lightweight band with a mixture of 50% Campo del Cielo Meteorite shavings and 10% green glow powder. 0% crushed opals and 30% pigment powder. The ring can be charged by Sunlight, UV lamps, Fluorescent lamps, black lights, typical household incandescent light bulb, etc. Each ring is milled from a solid piece of titanium and made to your ring size using a jeweler's mandrill. The ring is then shaped and polished. The inlay is then encased in a strong cyanoacrylate, making it water resistant and scratch resistant and ready for daily wear! This ring will be made to order in your size if you would like any other customization or general questions, feel free to send me a message! We handcraft your ring to your specific size, please be sure your ring size is accurate! We recommend a professional sizing from a local jeweler. 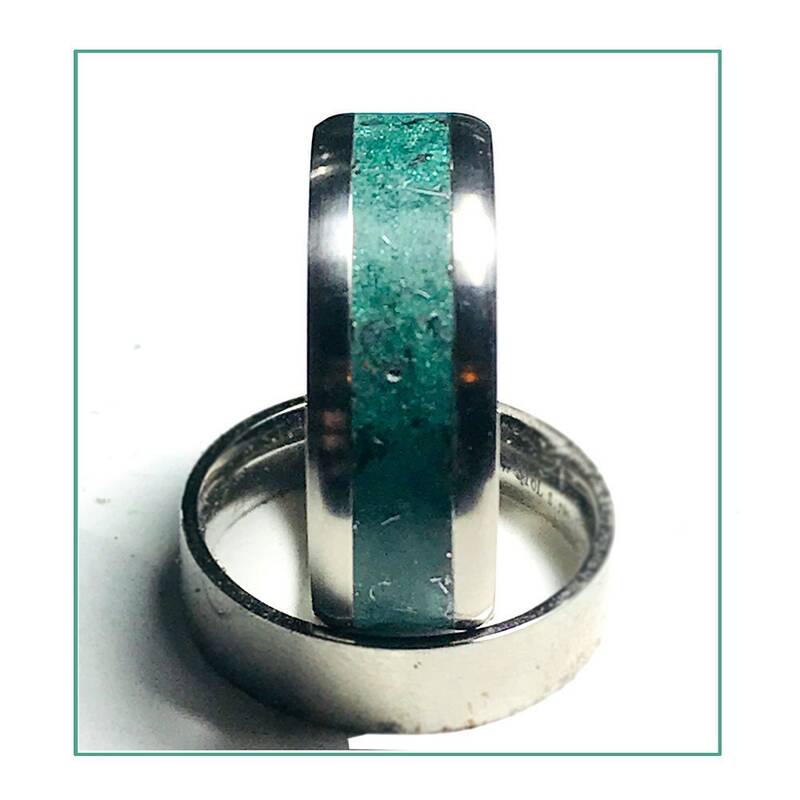 If you are unable to get to a jeweler we offer a ring sizing band for purchase in our shop (these ring sizing bands are in no way an equal to a professional sizing). All rings ship for free in the United States with first class service from the USPS unless upgraded at checkout. Any additional taxes or tariffs on international orders are the responsibility of the buyer. These rings are made to order at purchase, If a ring is damaged in transit it can be returned for an exchange, we, however, cannot accept returns on rings with a misstated size from the buyer.